Archaeologist finds the remains of the last czar's hemophiliac son and heir to the Russian throne. Bones were found in a burned area in the ground near Yekaterinburg , the city where Czar Nicholas II and his wife and children were held prisoner and then shot in 1918. A top local archaeologist said the bones belong to a boy and a young woman roughly the ages of the czar's son, Alexei, and a daughter whose remains have also never been found. If confirmed, the finding would solve a persistent mystery about the doomed family, which fell victim to the violent revolution that ushered in more than 70 years of Communist rule. It comes almost a decade after remains identified as those of Nicholas, his wife and three of his daughters were reburied in a ceremony made possible by the Soviet collapse but shadowed by statements of doubt - including from within the Russian Orthodox Church - about their authenticity. The spot where the remains were found this summer appears to correspond to a site described by Yakov Yurovsky, the leader of the family's killers, said Sergei Pogorelov, deputy head of the archaeological research department at a regional center for the preservation of historical and cultural monuments in Yekaterinburg. "An anthropologist has determined that the bones belong to two young individuals - a young male apparently aged roughly 10-13 and another, a young woman about 18-23," he told NTV television. Nicholas abdicated in 1917 as revolutionary fervor swept Russia, and he and his family were detained. The next year, they were sent to the Ural Mountains city of Yekaterinburg, where a firing squad executed them on July 17, 1918. Historians say Communist guards lined up and shot Nicholas, his wife, Alexandra, their five children and four attendants in a small basement room in a nobleman's house in Yekaterinburg. The bodies were loaded in a truck and disposed of first in a mine shaft, according to most accounts. According to NTV, a 1934 report based on Yurovsky's words indicated that the bodies of nine victims were then doused with sulfuric acid and buried along a road, while those of Alexei and a sister were burned and left in a pit nearby. The Bolsheviks who killed the czar apparently mutilated and hid the bodies because they did not want the remains of the family — especially those of the heir Alexei — to become objects of worship or spark opposition to their new regime. With the bodies lost for decades, hundreds of people came forward claiming to be a surviving member of the royal family. The most prominent was Anna Anderson, a woman who appeared in a mental hospital in 1920 and claimed to be the czar's youngest daughter, Anastasia. She said she had been rescued by one of the soldiers who killed the rest of the family and was carried out of Russia on the back of a peasant cart, eventually winding up in Berlin . In the 1990s, DNA tests revealed she was a Polish peasant named Franziska Schanzkowska. Parts of the royal bodies were exhumed in 1991 and reburied in 1998 in the imperial-era capital of St. Petersburg , following years of investigation and DNA tests in Britain and the U.S. 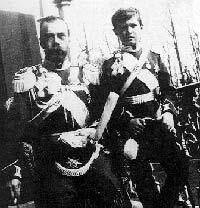 But the bodies of Alexei and one of the czar's daughters, either Maria or Anastasia, remained missing. The two daughters were only a year apart, and DNA testing cannot distinguish between siblings. Most Russian scientists believe the missing daughter was Maria, and scientific tests have indicated the bones of Anastasia were among the remains buried. The Russian Orthodox Church canonized Nicholas, Alexandra, Alexei and his four sisters as martyrs in 2000. But the church cited the two missing corpses and questions over whether the recovered bones were actually those of the royal family in its decision to scale down its participation in the 1998 burial ceremony.